The book: Sound Card Oscilloscope - Build Better Electronic Projects contains a slightly better circuit for the probe plus additional circuitry for calibration and a signal generator. These are all valuable additions to your tool kit. If you want to buy a cheap but inexpensive USB based oscilloscope then you could do worse than the Hantek 6022BE USB scope. The PC probe circuit could hardly be simpler. Each channel consists of an input resistor (R1/R2) to protect the overload diodes (D1-D4). 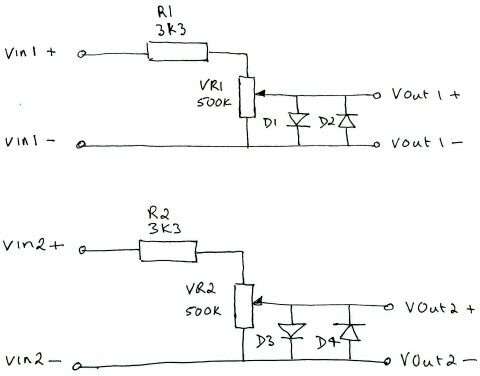 The signal is fed through the input resistor to the potentiometer (VR1/VR2) and then out again to the PC sound card mic or line in input. The diode pairs D1/D2 and D3/D4 are connected head to toe to limit the microphone input to approximately 500mV. This should protect your PC from any damage providing that you do not attempt to use the probe on signals greater than 10-12 volts. The input resistor together with the potentiometer convert the signal you want to examine to a level that does not overload the sound card input circuitry. If you allow signals that are too large to pass through then you will see the signals distort on the screen.